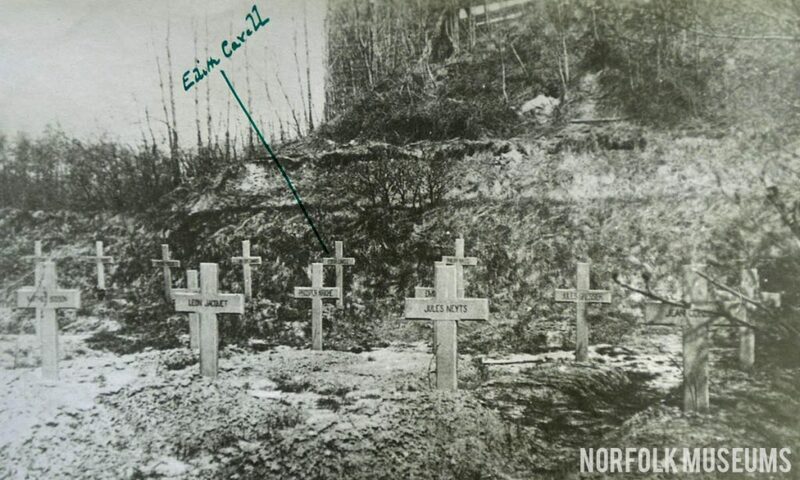 This rough wooden plank is thought to have been part of the cross marking the grave of nurse Edith Cavell at the Tir National (national shooting range) in Brussels. She was hastily buried close to her execution post on October 12 1915 and a wooden cross with a simple number was put in place. Its precise provenance is, however, unclear. The sealed notice on it is now illegible but appears to have been prepared by the Director of the Tir National. 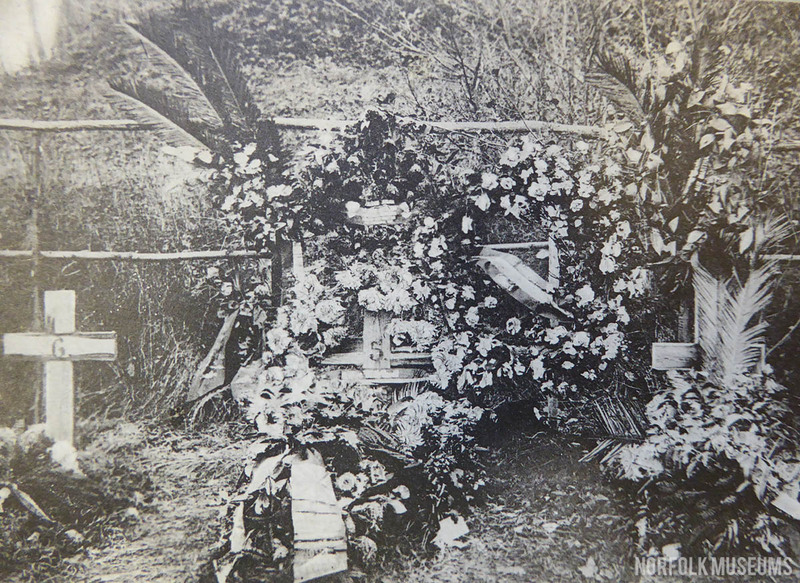 The wooden piece does not correspond precisely to the attached photograph of the original grave (or other such photographs). The pencil text reads ‘Canadian… March 1919’ and, in blue, to “..A R Valentine 1st Regt S(outh) African Infantry”. It has not yet been possible to link either inscription to involvement of Imperial forces in the operation to clear the remains of those shot at the Tir National after World War I. 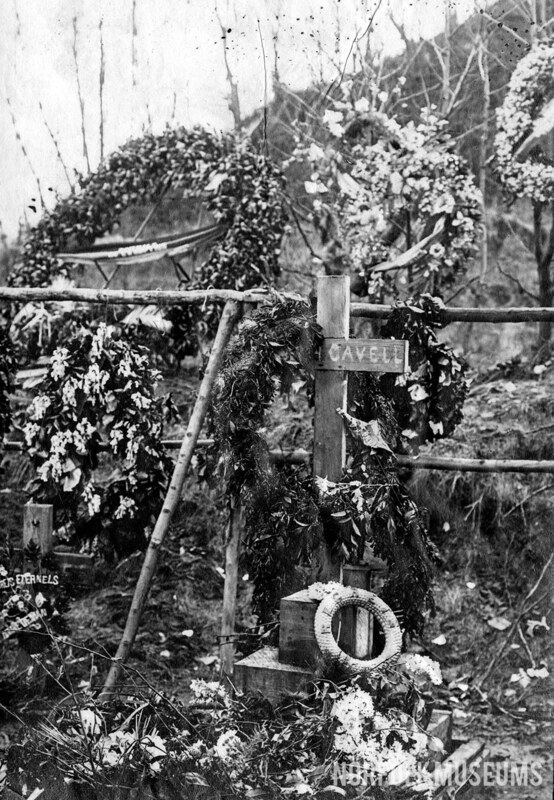 Nurse Cavell’s body was brought back to England in May 1919. Following a national memorial service in Westminster Abbey, she was laid to rest outside the east end of Norwich Cathedral. The original gravestone is still there, alongside a new stone and emplacement dedicated on Whit Sunday 2016. If you have evidence on this matter please email it to enquiry@edithcavell.org.uk. The images supplied by the Royal Norfolk Regimental Museum quite clearly show the original cross which differs from the marker at the London Hospital Museum, part of the original is now believed to be in St Mary’s church Swardeston. Black and white images courtesy of Kate Thaxton and Norfolk Museums Service and the Royal Norfolk Regimental Museum.